It’s a win when you find cookies without palm oil. If you’ve ever been on the quest for baked goods without palm oil ingredients, you know it’s a challenge. Usually, the less chewy the cookie, the better the chance it won’t contain palm oil. While these cookies are all crunchy, they are still filled with excellent flavor and mouth-feel texture. To the best of our knowledge, after cross-referencing their ingredients against hundreds of names of palm oil derivatives, these cookies do not have any palm oil ingredients. We have reached out to these packaged cookie companies to confirm. We update this list regularly. They use whole grain and don’t contain artificial ingredients or preservatives. They are Non-GMO Project Certified. Erin Baker’s have confirmed all of their products, including their cookies, are palm oil free. Usually, just one flavor of cookie will be palm free (if you can find them at all). The fact that Pepperidge Farm makes all four of these without palm oil is amazing. We bought the Milk Chocolate Chip, and they taste fantastic. They are filled with rich chocolate chips and have the look of bakery cookies. They are about two and a half inches in diameter. These cookies contain real ingredients, including Chocolate, Flour, Butter, Sugar, Brown Sugar, Cage-Free Eggs, Baking Soda, Vanilla Extract, and Salt. These cookies don’t contain palm oil ingredients AND are gluten-free. They are crunchy and will satisfy your cookie craving. I’ve never had a gluten-free cookie until trying the Chocolate Chip flavor. They tasted great. These are about one and a half inches in diameter. 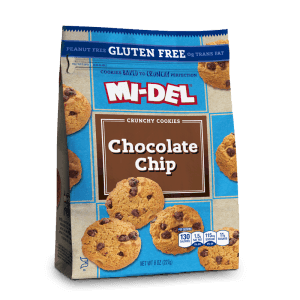 All of MI-DEL’s cookies are 100% peanut free as well. 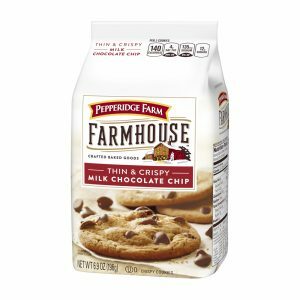 Hooray again for Pepperidge Farm! 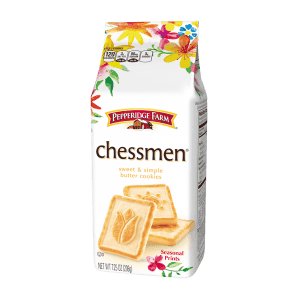 Months ago, I bought a winter holiday version of these Chessmen cookies when I saw they were palm free. I bought them again. They are made without artificial flavors or preservatives. These are tasty butter cookies usually available with a printed design for the season. My family loves these cookies. This is a great brand to support if you are looking for cookies without palm oil. Their Simply MI-Delicious line of cookies are 100% palm oil free. They contain organic enriched wheat flour and organic cane sugar. 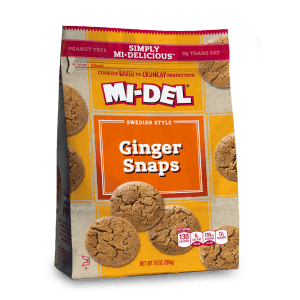 It’s awesome MI-DEL makes so many cookies without palm oil. In addition to making gluten-free breads and snacks, they make these gluten-free cookies without palm oil. One would think all animal crackers would be safe, but they’re aren’t. Even the organic animal crackers at Costco are not. However, this brand from Target is palm-oil free. They don’t contain artificial flavors, colors or high fructose corn syrup. I’ve been buying these for months, and while they are somewhat plain — as most animal crackers are — they make for a great school snack. We are researching and reaching out to more companies and will hopefully be adding to this list soon. Companies sometimes change their formulas and use palm oil ingredients because it’s a cheaper oil and it remains semi-solid at room temperature. As an example, my son used to be able to eat original Oreo cookies safely until they changed their ingredients to include palm oil. Also, often we assume organic products are made without palm oil but that is not always the case. Whether you buy pre-made cookies from a grocery store, a bakery, Target, Walmart, or from Costco, they will likely have palm oil. So it’s easy to avoid products when you see palm-. Examples are palmitate and palmitoyl. However, also learn to look for laur-, stear-, and glyc-, as they are usually made with palm oil ingredients. How to find products without palm oil. It’s so great to have chocolate and non-chocolate cookie options available. There are recipes for homemade cookies without palm oil. But often we don’t have time to make cookies from scratch. It’s great to be able to buy prepackaged cookies free from palm oil. You may be avoiding palm oil because of environmental concerns or because of a palm oil intolerance. According to the World Wildlife Fund, palm oil is now in up to 50% of products on supermarket shelves. After learning more about palm oil and how increased demand is causing environmental concerns, as a family we are working to eliminate products with palm oil from our home. Palm oil makes our son sick with allergy-like symptoms so we are avoiding it completely. Verify labels as manufacturers change ingredients. As of this writing, these cookies are made without palm oil or any palm oil ingredients and derivatives. A representative from Pepperidge Farm replied with a personalized, lengthy email to my specific questions about palm oil and palm oil derivatives in their cookies above. So while they may change in the future, these cookies above are a good place to start when you are looking for palm oil-free options. If you know of other packaged cookies without palm oil, please list them in the Comments so we can add them to this list. Thank you! It’s important we support these lines of palm-free cookies. We are not medical professionals. This is not meant to be medical advice. Please consult with your physician. Use this information as a starting point as it’s not guaranteed. Read all labels at the point of sale. Palm Oil Allergy? Intolerance? Can You Be Allergic to Palm Oil?